And the way others (high achievers even)—with moderate success-think. Very few people understand Universal Laws and how to apply them. The others attempt to manipulate their circumstances, and never gain the perspective that equals exponential ROI. Your Money (and your Mental Clarity) is NON-Negotiable. I hope that sounds like a plan to you, and if it doesn’t, my 6-part course won’t help. This is about TRUTH…and how to see it WITHOUT your subconscious toxifying your understanding. This is about DESIRE…to be a better leader, a better coach, a better closer, or simply a better citizen of the world. And this very real transformation will happen for you, EVEN if you can’t see what is possible right now. All the questioning and the struggle STOP within 6 weeks. Join me for my 6-part course, and you will become a more strategic, answer-focused thinker because your mind functions from a place of clarity, not confusion that mucks you up. Apply the 7 Universal Laws to everything you do in life, so that you remain clear on what’s true and what’s toxic. Spot each and every opportunity that comes your way, and always know the next move you’re going to make. Understand what’s a cause and what’s an effect—knowing the difference means everything when it comes to maximizing your prosperity! Create money…and not “get-by” money…a real income that funds the life you’ve always wanted to live. Know which problems actually need solving, along with the blind spots that keep you stuck at the starting gate. As the best-selling author of The Millions Within, I teach entrepreneurs and commission-based sales professionals how to quantum leap their current incomes past the 7-figure income level, often in less than 12 months. As a world-class speaker, sales trainer, and success-mindset mentor to some of the globe’s top CEOs, I’ve privately mentored some of the most successful solopreneurs of the last decade, including Suzanne Evans, Fabienne Fredrickson, Kendall Summerhawk, RJon Robins, and Angelique Rewers. Results like this can happen for anyone. Even you. 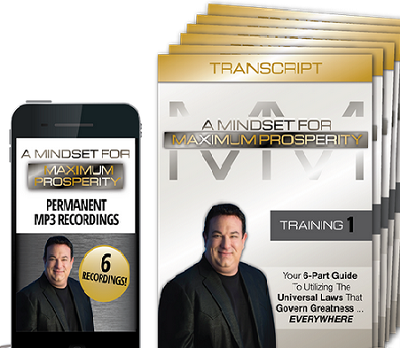 Access the mindset and manifesting secrets of multimillionaire entrepreneurs, so that you can lead your most prosperous life. Understand the Laws, so that you can pull others out of their “stories,” and lead them to “see” what it is that they need to move forward. See where inaccurate thinking causes limited success, so that you become self-aware of the way your mind works to trick you. Become exponentially more confident and more “knowing,” so that your clients and others see you as someone worth listening to, following, supporting. There is a barrier to achieving greatness, but there is one clear way through it. You’re about to discover the 7 Laws that come from the original hermetic teachings, and applying these Laws allows you to eliminate confusion, doubt, fear, and worry…so that you can achieve the greatness you were born with. Discover the Law of Polarity, so that you have the heightened awareness it takes to identify massive opportunity hiding in plain sight. Tap into the Law of Rhythm, so that you learn exactly when to advance forward, and exactly when patience must rule the day. Grasp the Law of Relativity, so that you perceive circumstances through accurate thinking (rather than through your emotions), and take action in the right way. Understand the Law of Gender, and how the differences between masculine and feminine principles dictate your actions, so that you will approach solutions from a place of balance. Master the Law of Gestation, so that you know the right timing for every move you make on the path to your success. Apply the Law of Perpetual Transmutation, and how everything in the Universe consistently moves, so that you can change your thinking to change your life.